Ellen DeGeneres has launched a new pet product collection at PetSmart. Ellen's deal with PetSmart was first announced last June. The new capsule collection is called the ED Ellen DeGeneres Summer Camp Collection. 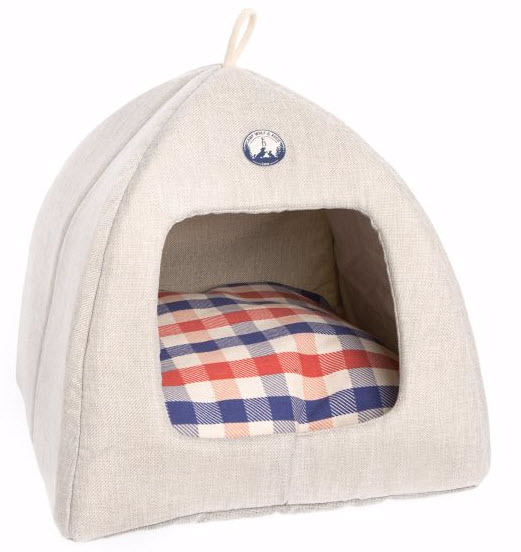 The Camp Hut Pet Bed is pictured above. The bed features tan, blue and red colors. The plaid cushion is removable. It is made to be indoors for dogs under 15 pounds. The bed measures 14 x 14 x 15 inches. It has a Camp Wolf & Augie logo on the front.